this entree add flair to an elegant buffet. Preheat oven to 350° Bring a quart of water to a boil, and blanch broccoli 30 seconds. Immediately plunge into ice water to stop cooking process. Set aside. Stir together the next 3 ingredients iIn 5 qt. saucepan over low heat. Add the tomato paste and wine; stir. Add basil, garlic, and bay leaves. Simmer until ready to assemble casserole. Cook lasagna noodles according to pkg. directions, drain noodles and rinse with cold water. Place drained tofu in a large bowl, and mash with potato masher. Add all remaining ingredients, except basil, one at a time, stirring after each addition. Drain and rinse noodles. Cover bottom of a 9" by13" pan with prepared sauce. Spread about 1/2 cup filling along the center of each noodle, then roll the noodles up. Tuck a broccoli florette in both open ends of each roll and place in pan, 2 across and 5 down. The rolls lay side by side with the florettes facing outward. 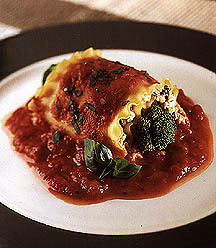 Top with sauce and sprinkle with dried basil. Cover loosely with foil. Bake 30 minutes. Remove foil, bake another 15 minutes. Calories 181, Protein 17g, Carb 62g, Fiber 5g, Fat 2g, Chol 0.0mg, Calcium 66mg, Sodium 440mg.